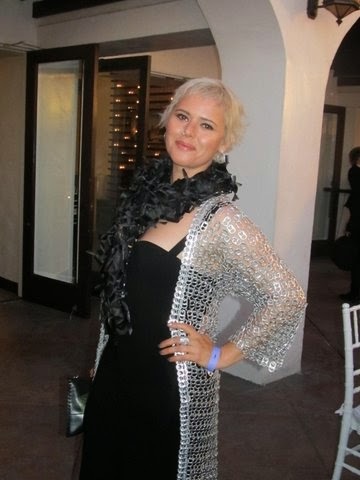 Mikey Koffman and her new company Endless Road Entertainment Inc, hosted the 2nd Annual L.A. 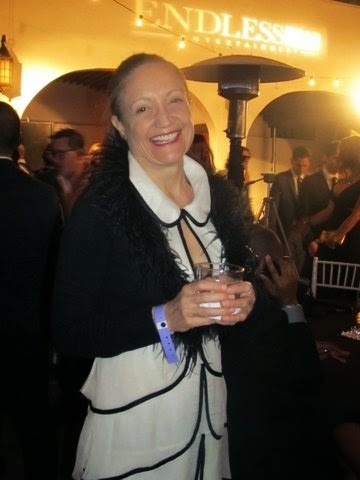 Fashion Awards at Sunset Gower Studios this past weekend. Fashionistas, stylists, celebrities, and couturiers used the opportunity as an excuse to dress to impress (as one should at a fashion event). It was a beautiful night in Hollywood and the former restaurant turned event space was the perfect location to mingle under the stars. I had the pleasure of meeting the lovely entertainment blogger Tracey Paleo. Brazilian designer Walleska Tepping created this fabulous piece entirely out of pull tabs for her eco-friendly line Eco Chicc. 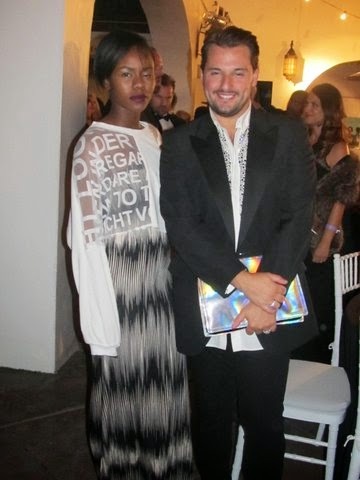 David Giampiccolo escorted this beautiful model who was wearing one of his designs. And this darling gal recently made the transition from fashion to pastry and has her own shop in Downtown LA called Bronzed Aussie, which serves a variety of sweet and savory pies. Live model installations and designer presentations by Shail K, Nathanaelle, Le Mali Designs, and Amour Luxury Swimwear took place out in the patio. Models wore jewelry by My Bijoux Box, which was available for purchase at the design suites as were Straitjacket Sam’s fabulous bow ties and accessories. In the lounge area Planet Salon and NYX Beauty Bar offered complementary beauty treatments for the ladies, Felix Omar Men’s Grooming Studio provided scalp massages and shaves, and Shine Time Shoe Care offered complimentary shoe shines. Guests enjoyed a hosted bar, food from Haute Chefs Los Angeles, and killer tunes spun by DJ Mad Mike and DJ Diversity from Amp Radio. Celebrity guests included the cast of Bravo’s Vanderpump Rules, Justin Bird (Millionaire Matchmaker) International model and actress Carissa Rosario, Blanca Blanco from Awakened, Jenna Willis from Grey’s Anatomy, Tiffany Brouwer from The Help, Marcus Shirock from Hercules, and the handsome duo behind Skinny Executives, Alan McCune and Enrique Godoy Ynzenga. Before the ceremony began Mikey asked for a moment of silence for recently deceased American costumier, L’Wren Scott. After we paid our respects Sabrina Antoinette kicked things off with “Kiss Kiss x Bang Bang” off her newly released EP. 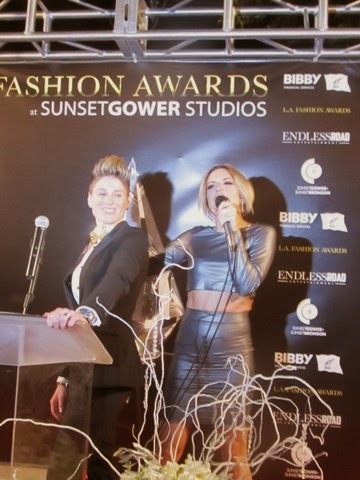 This year awards recipients included Sunset Gower Studios, Nobu Hotels, Bibby Financial, Monster Energy, AMP Radio, Pozarazzi (Media Award), Troupe Productions (Fashion Achievement), Shail K (Couture), Nathanaelle Couture (Contemporary Womens), Amour Swimwear (Resort Swimwear), and Le MaLi (Emerging Designer). Designer Lloyd Klein was the recipient of the Fashion Icon Award. As he accepted his award he announced that he recently underwent chemo and expects to be cancer free in a few months. We wish you a speedy recovery Lloyd! And, by the way you’re incredibly handsome with a shaved head. I was so happy to hear that the lovely Rachael from Straitjacket Sam won the Design Suite Award. I absolutely adore this girl and can’t wait to do a feature on her. The Beauty Partner Award went to Planet Salon for their longtime support of L.A. Fashion Weekend. Tonight was also Planet Salon owner Ginger Boyle’s birthday and Sabrina ended the evening with a special birthday tribute to her. Hiroshima the summer months shopping bags will be hence bright colored. chanel replica Not surprisingly, standard light red wide variety of camouflage designer purse would probably get a head to get colouring industrial wave with style set baggage. replica dior Newer business enterprise although by using unique adore and also innovative romance may want these types of teenager design and style. chanel replica bags Around the same time, green colouring selection of set travelling bag would probably satisfy the time periods with global recognition. Especially for impressive green shopping bags, it may well display your heating and also inspiration laid back to soul. prada replica Understandable all of prominent set travelling bag famous brands possibly will unquestionably submit an application these kind of colouring, allow for of it's own a named camouflage shopping bags with Hiroshima. chanel replica bags Them creates usage of all these colouring range covering the family vacation break up set. Completely happy green summer months shopping bags could unwind women of all ages. As well, a light-orange camouflage designer handbag style and design can be as well well-liked such time frame. You could possibly without restraint get a look at.